In the midst of NYFW madness I was able to meet and interview James Vincent for Mehron, half-completed face-chart in his hand, as he prepped for the ELLE x Kohl’s SS15 Runway Collection show. 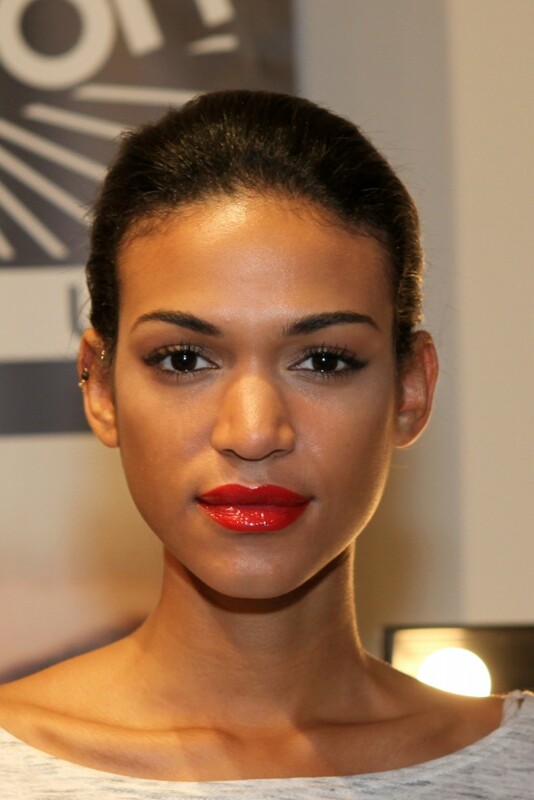 To sum up the look, Vincent said, “It’s about a strong brow and a glossy lip. It’s more about style than fashion.” When probed, he explained the look spoke more to individual style than to a specific, one-size-and-look-fits-all fashion concept. Which underscores his thoughts on reinterpreting the makeup your own way to fit your own daily lifestyle. Vincent used Mehron Celebre Pro HD Makeup foundation and Celebre Pro HD Loose Mineral Finishing Powder, plus powder to contour. CHEEK Cream in Geranium was also applied. Skin looked like skin, in the best possible way. Vincent used a pencil to draw in individual hairs followed by a matte shadow to set the pencil and add dimension. The effect was a strong but not overdone brow. Vincent used E.Y.E. powder in Natural Wheat to contour the eye and E.Y.E. Liner Pencil in Black. Just as he layered brows, Vincent topped the pencil with black liquid liner along the top lashline “for added dimension.” His liner extended beyond the outer corner slightly upward toward the tail of the brow for a subtle but chic cateye. Vincent painted lips in L.I.P. Color Cream in Valentine, then added Glosstone PRO in Red Kiss as a shiny topcoat. Vincent recommended adding gloss to the center of the lips only (the “hot point”) when recreating the look for just an illusion of fullness. He also suggested pressing lip products onto the mouth with fingertips, tossing aside the lip brush, for a pretty popsicle stain. The look for ELLE x Kohl’s was a beautiful demonstration of a classic but still effortless look. Vincent loves the notion of the flush on the cheek matching the lip stain. He sees monochromatic makeup as modern and fresh. And this interpretation of monochromatic makeup (along with its “everyday” customized options) is a really nice departure from the ubiquitous “no makeup makeup” look on runway after runway. A red lip for the everyday girl is my kind of everyday. RIGHT?? Elle for Kohls!! Who knew?